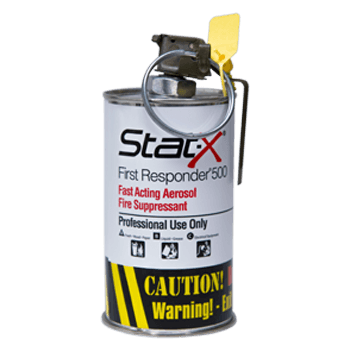 When a fire breaks out in the bus passenger compartment one or two Stat-X First Responders® can be deployed by a trained professional. The Stat-X First Responder will suppress the fire allowing for the passengers to exit. Breathing the aerosol is not harmful which is especially important in the case of elderly, handicapped passengers, or children that will be exposed to the Stat-X aerosol for longer periods of time during a fire event. This Stat-X First Responder is hand deployed to suppress fires aid responders to assist with egress.